Talking about traditional UP curries one thinks of a spicy hot curry with deep colors and robust flavors. Winter and spring time curries are more spicy than the summer curries. Seasonal produce is used in the most appropriate way. I have been cooking spicy curries this winter more than ever. 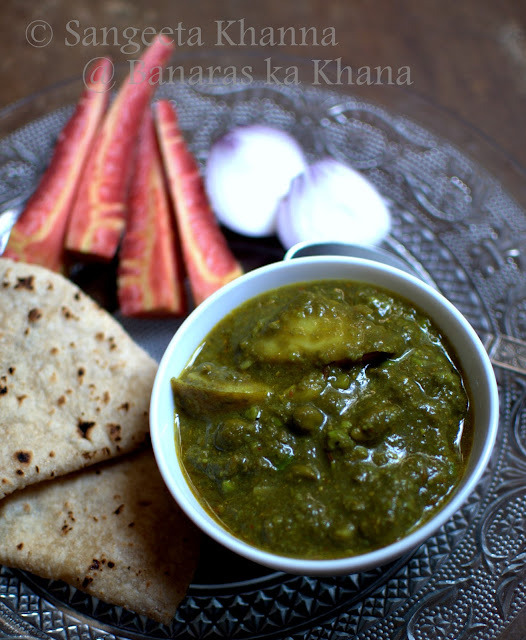 Harey chane ka nimona was also cooked for the love of eastern UP style curries. I have been talking about nimona a lot on this blog and noticed that a few of my friends and readers tried out my nimona recipes and wanted more of them. Of course variations of it. I knew how addictive these curries are. And all of them so different from each other in final flavors. This Harey chane ka nimona is yet another version of a lentil curry made using a paste of the lentil. Fresh green chickpeas or garbanzo beans are used for making this nimona but soaked green or brown chickpeas can also be used. This one a little more spicier than the other ones. The reason is, chana or chickpeas is loved in the spicier avatar in Eastern UP. The curry is enjoyed most with plain boiled rice or sometimes chapati. Heat oil in a heavy based pan and tip in the cumin seeds. Let them crackle. Add the cubed potatoes and half of the whole green chickpeas. Stir fry for a couple of minutes. Add the masala paste and bhuno for about 5 minutes or till the masala gets aromatic. Add salt to taste and mix well. 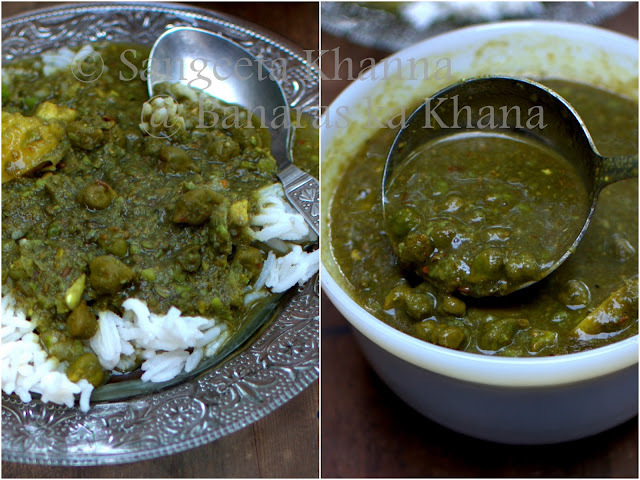 Add the coarse paste of green chickpeas, mix well and bhuno for a couple of minutes more. The paste now becomes a little lumpy but wont stick to the pan if you keep the flame on the lower side. Just let everything mixed up so the spices are soaked in. Add about 3 cups of water, cover the pan and simmer the curry for about 10 minutes. Adding more water if required. Serve hot with plain boiled rice. Some people like it with parathas or pooris. It is a tasty spicy curry that can go well with any traditional bread or rice preparation. Simple home cooked meals used to be frugal most of the times as the lady of the house was the only one contributing to the kitchen or cooking most of the times. I am talking about middle class Indian households, the way food traditions are formed. So one curry and one daal used to be cooked mostly, sometimes the daal and curry was rolled into one with such curries like nimona. It made sense as taste and nutrition both were taken care of. Joint families used to have more elaborate meals I have seen. Many more hands to contribute to the cooking process and many more choices to be catered to. In nuclear families, elaborate meals were prepared only on weekends or on festivals. Who cared when frugal was so yummy. Delicious n tempting dish. Do visit me too. Wish I could send you some ..
Looks delicious. Spicing is definitely different than in my default matar ka nimona so I am excited to try it. By the way is the second ingredient in the paste supposed to be 1 tablespoon ginger? Thank you for pointing out Jenni. Editing the ingredient list to correct. It is ginger. Good to know you make kanji too, this is my all time favorite drink that is almost always fermenting either with carrots or beets.